First big fishing day of the year! Perfect weather….blue skies, light wind, warm enough to paddle in a vest. It was destined to be a great day. The venue had to be Boscastle and Tintagel. 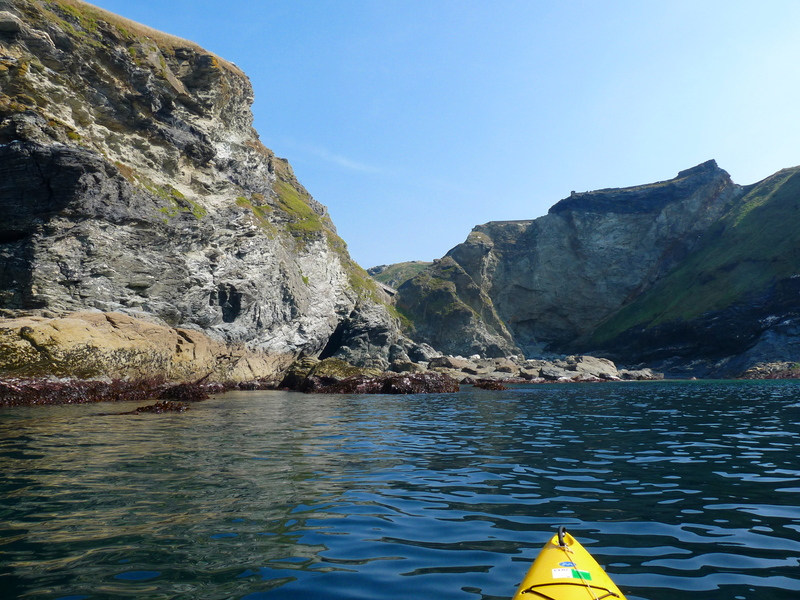 It’s not very often you can venture out onto this bit of the North Cornwall coast and lounge about on your kayak as if you were in the Mediterranean. 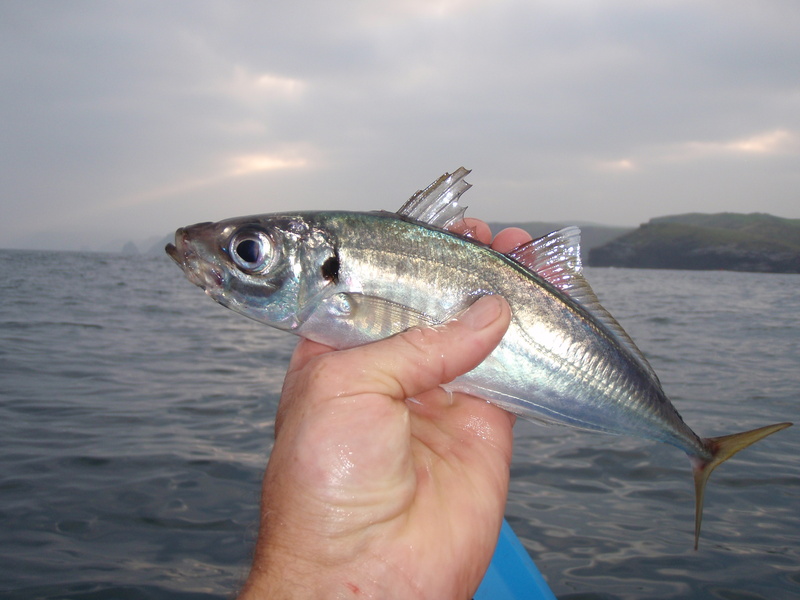 My plan was to hitch a ride on the big Spring tides and stock up on a load of mackerel as bait as I drifted with the ebb tide down past Tintagel, then get all geared up for a bit of shark fishing as I drifted all the way back again on the flood tide. 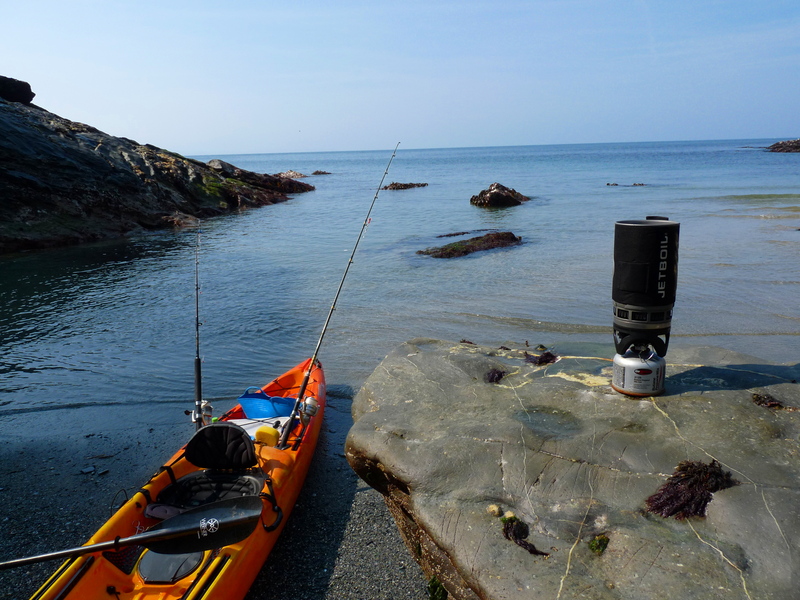 I always think it’s a good move to clock up a few miles when out for a day’s fishing, as if you don’t catch anything at least you’ve seen a bit of coast and done a bit of paddling. Although today was mainly drifting. My plan failed straightaway. 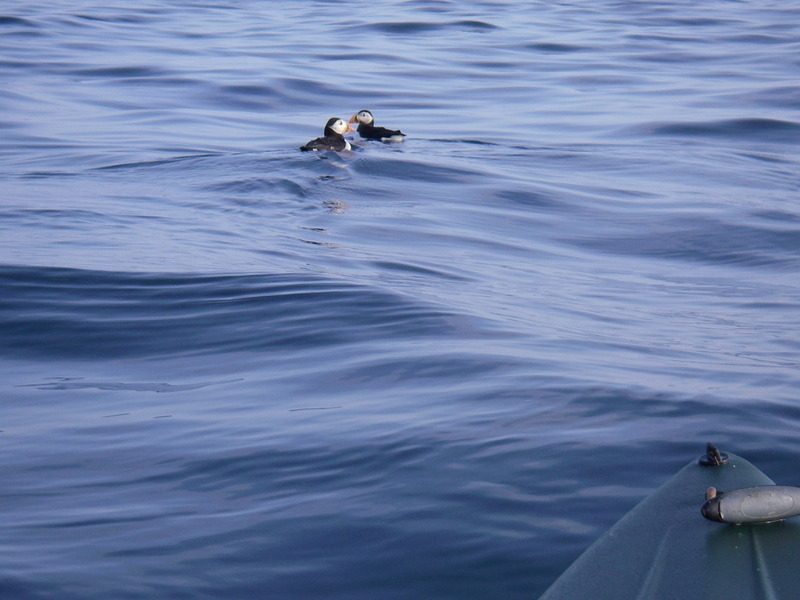 After two hours of trolling a set of feathers for five miles I had only caught two small pollack. Maybe I was a bit fishing rusty. I continued on south to take a swing round Gull rock off Trebarwith Strand. Maybe conditions were TOO benign. More or less calm and gin clear water. But at last a fish which shook the rod tip in a maniacal manner.It was a mackerel. No hang on, it’s not, it’s something weird. I turned back up the coast close to the big cliffs and at last started to haul in a selection of mackerel that would surely make the average shark salivate. I stopped for lunch (two peanut butter sandwiches followed by a big cup of tea from the Jetboil) on a tiny beach exposed by the low tide in the armpit of Tintagel island. A great crocodile of tourists wound their way up the path to the top of the island, no doubt muttering about Arthur and Merlin. 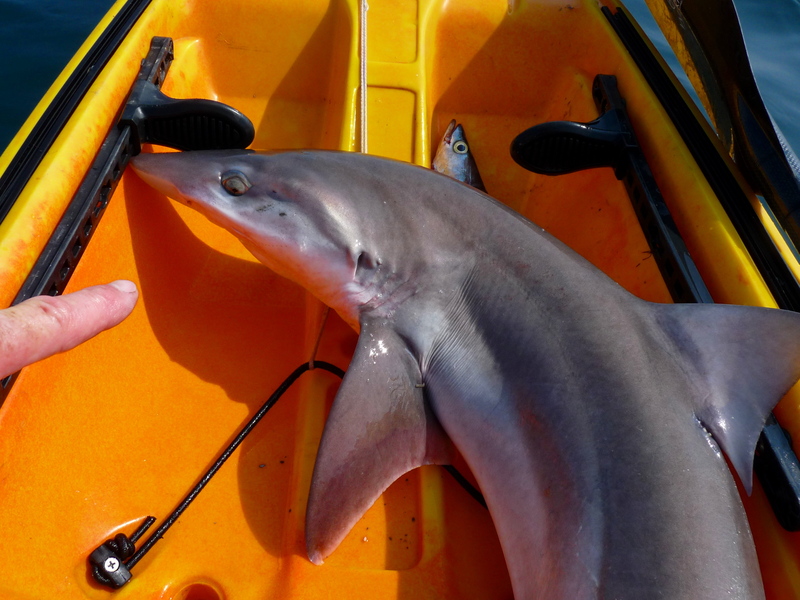 Don’t suppose any knights of the round table went fishing for sharks in a kayak. I was so excited I couldn’t wait for the tide to turn. 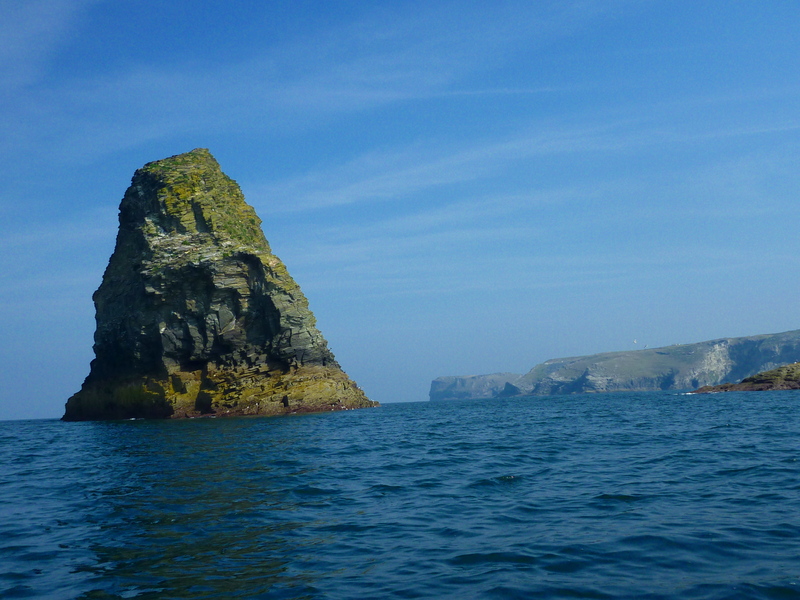 I paddled directly offshore from Tintagel island for about a mile. 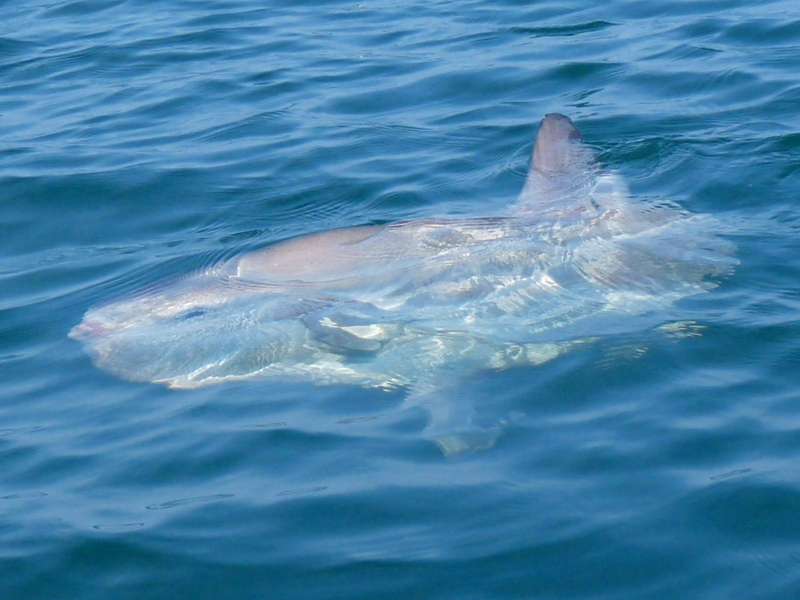 A sunfish was wallowing at the surface doing what sunfish do best i.e. loafing about and looking half dead. This was quite a big one….about a metre across. This was it. 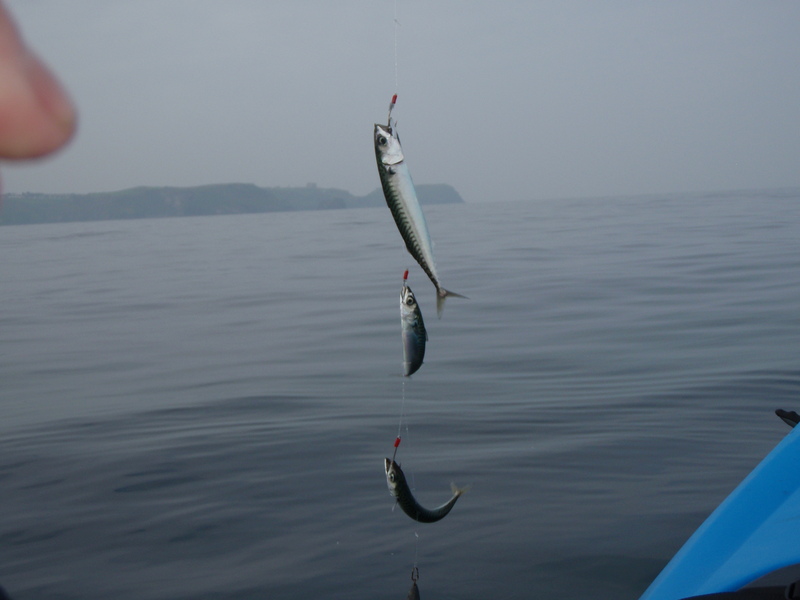 I ledgered a mackerel on the end of a wire trace down to the bottom on one rod, and then attached a float to another and let it drift away just beneath the surface. This is the technique to catch a Blue Shark. 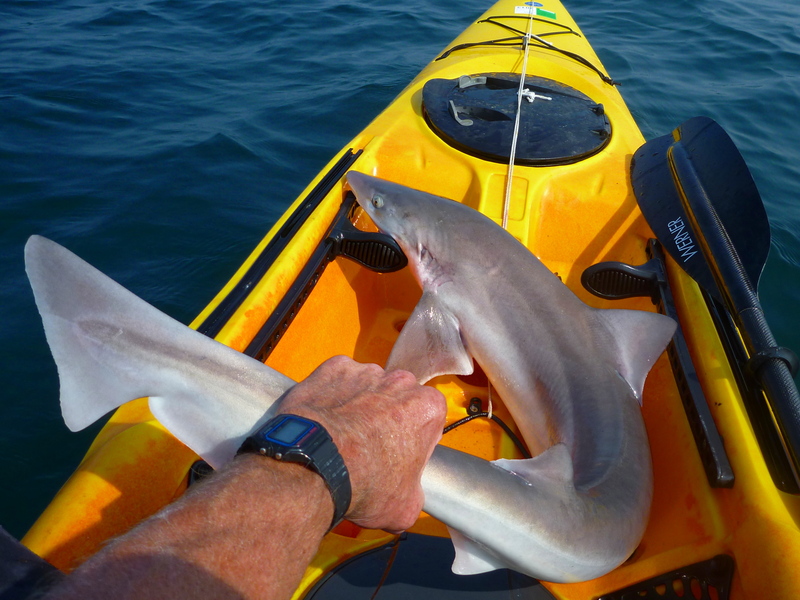 Don’t think anyone’s ever caught one of these from a kayak before in UK. They’re not supposed to come close to land but I don’t see why not. It’s got to be worth a try. Normally I wouldn’t dream of sitting about on the sea in such a hostile place. It is hardly ever without swell or wind chop. 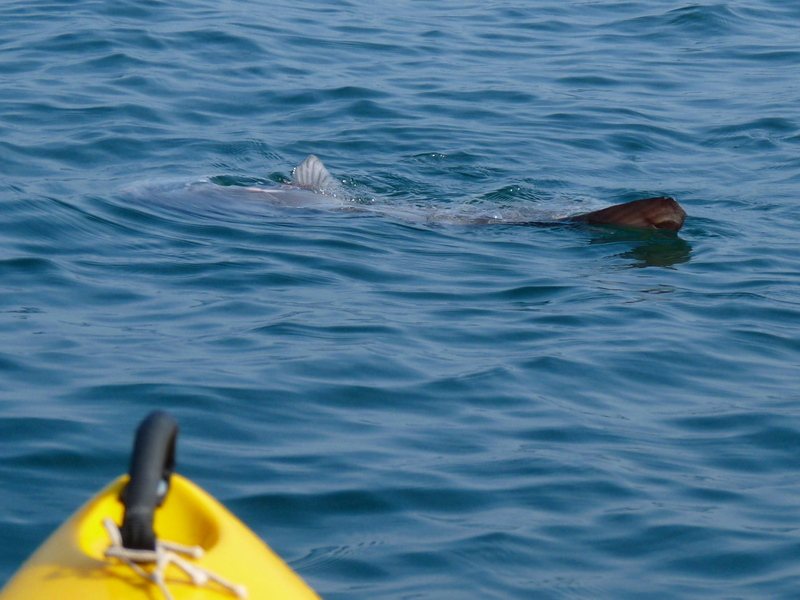 But today was flat AND I was perched on my superstable Tarpon 160 supertanker. Totally and utterly safe. And surprisingly fast. But horrifically heavy. So I waited. Not for long. My eyes popped out on stalks when I was absent-mindedly watching the float and it dipped below the water. And the rod bent right over. Good grief. It’s got to be a Blue. The next five minutes were a blurr as my brain blew several fuses. A very big tuggy beast was on the end of the line. Then suddenly it wasn’t. The blooming hook had pulled out of the crimp.I hope the spirit of Sir Lancelot didn’t hear my expletive.Blooming heck (that wasn’t it, by the way). I rigged up another trace and waited another 10 mins. This time the rod with the line at the bottom exploded into action and I battled with another hefty beast, which also got off before I eyeballed it. More expletives, more blown fuses.Perhaps I should upgrade to five amp or even a short section of coat-hanger(like we used to use at school to fix a dodgy plug). A third bite at last produced a fish from the depths and I peered over the edge to see a pretty good sized Tope on the way up. I didn’t put up that much of a fight for a 40lb fish, until I got it onboard and it had a new lease of life. Hook out. Photo taken. Fish put back safely. And then another Tope, this one slightly bigger than the last, I would guess 50lbs. And that was it. All the action in about 90 mins just after low tide. I sat and watched the coast roll past for the next four hours until I was just about back level with Boscastle. Not another bite.The bait mackerel were completely un-nibbled. Inexplicable. But all part of the fun and unpredictability of fishing I suppose. Blue Shark next time maybe. Really dumb thing to do. For the first time ever my ‘go whatever’ mentality wavered and I had resigned myself to building an igloo on the lawn. Fresh snow made the drive to the sea look dodgy but annoyingly Dave’s Subaru made short work of it and we found ourselves in Boscastle ready to set off in temperatures of about 5 below, having met up with fellow die-hards Austen and Keith. Great paddling round the inshore side of Short and Long Island and some gob-smacking cliff scenery and gulches to explore. What on earth are those ancient walls and paths down to precipitous cliffs and inlets all about? I hope people didn’t used to load tin or copper onto ships around here- their beards would have gone grey waiting for a calm enough day. Gotta be crazy. But not as crazy as kayaking on this particular day of Siberian climes. We coffeed on Bossiney beach and found a baby seal which wasn’t looking too clever with a missing eye. Great Black-backed gulls guilty I suspect. We really didn’t need a headwind for the return trip but it arrived as forecast. We tucked in close to the islands and shore to baffle the wind. Precipitous cliff faces were all absorbing so took our minds off the flog. Just managed to get through the doors into the Cobweb inn in Boscastle before becoming clinically ill through lack of bodyheat. Pint of Guinness cures all. Quick evening raid to Boscastle and I didn’t really expect to catch much as the sea was quite lumpy ( and I hadn’t caught any fish for ages anyway, so didn’t want to raise my hopes foolhardily). Minimalism was the order of the day: a single rod armed with a Dexter wedge so I could sling it out behind and get fishing in less than three (approx) seconds. Wallop! I hauled aboard a 3lb bass, a 5lb and two 3lb pollack ( plus a couple of littly bass and unbelievably small pollack, which went back) within an hour. 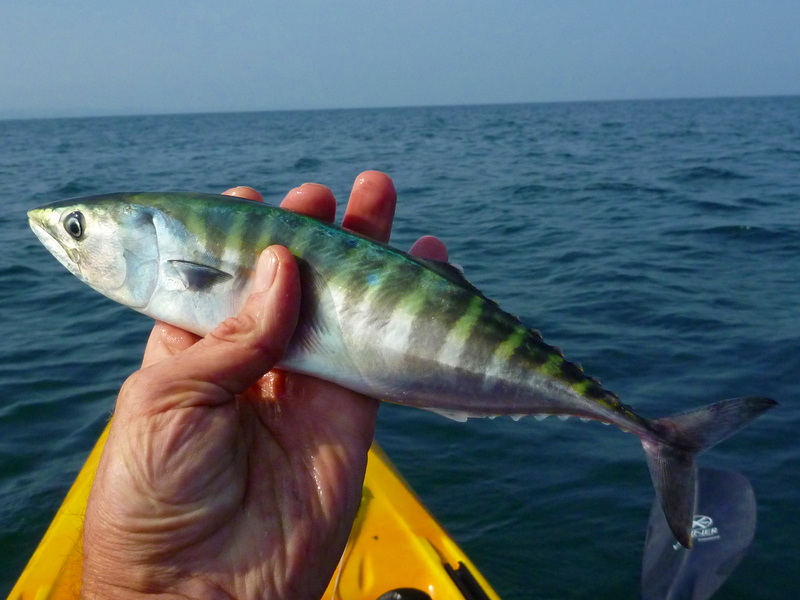 Oh….and a mackerel. 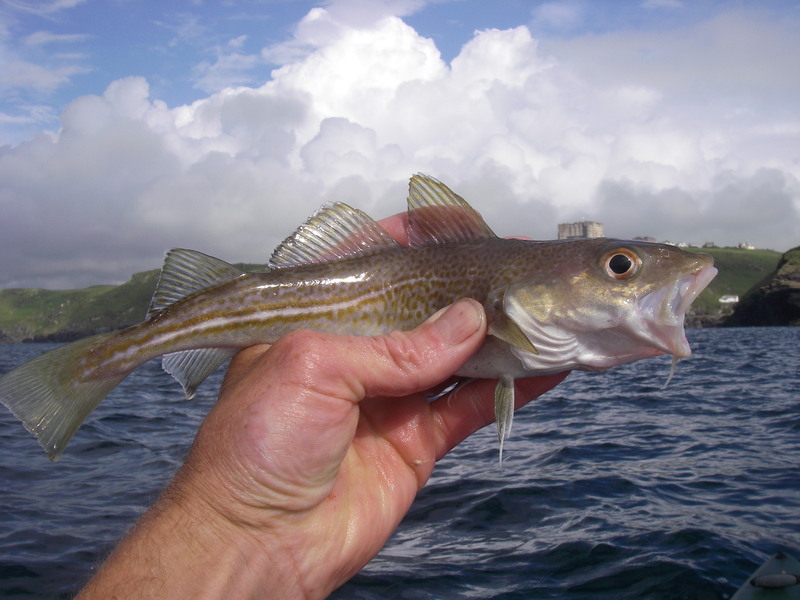 So Boscastle is not only the top scenic destination in the south-west, and one of the top marine life areas, it also does fast fishing. 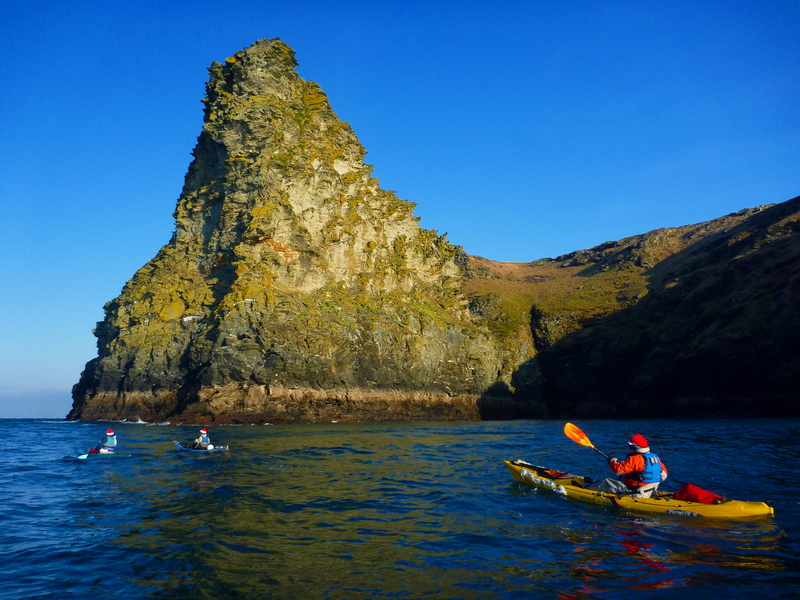 Early morning paddle to Boscastle this morning for spot of fishing and wildlife viewing. Caught about 8 pollack (yawn) and a couple of mackerel (slight yawn) on a trolled toby, but major highlight of the trip was sight of one of the elusive pufins that nest on Short Island. I’ve never seen more than three there so complex mathematics would suggest two pairs maximum. 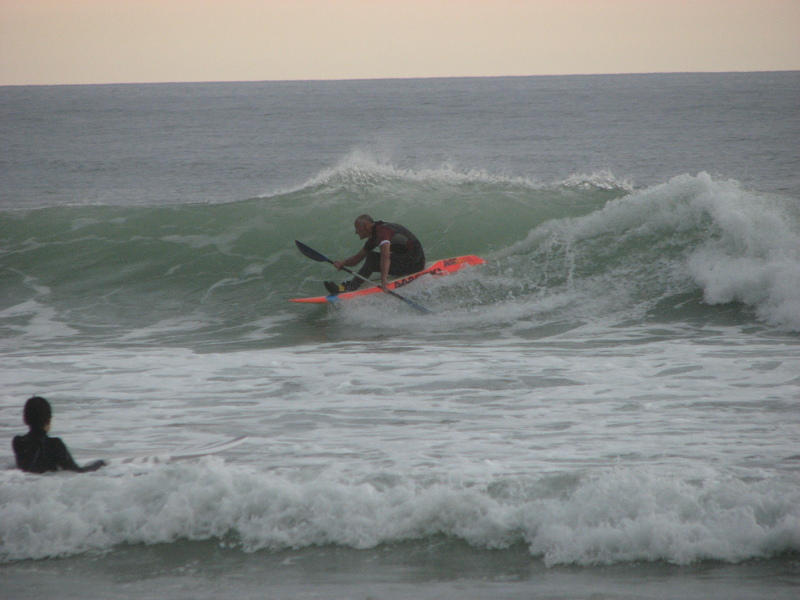 My passion for surfing (on a wave ski with a paddle of course) was wearing thin because all the beaches were getting so busy. 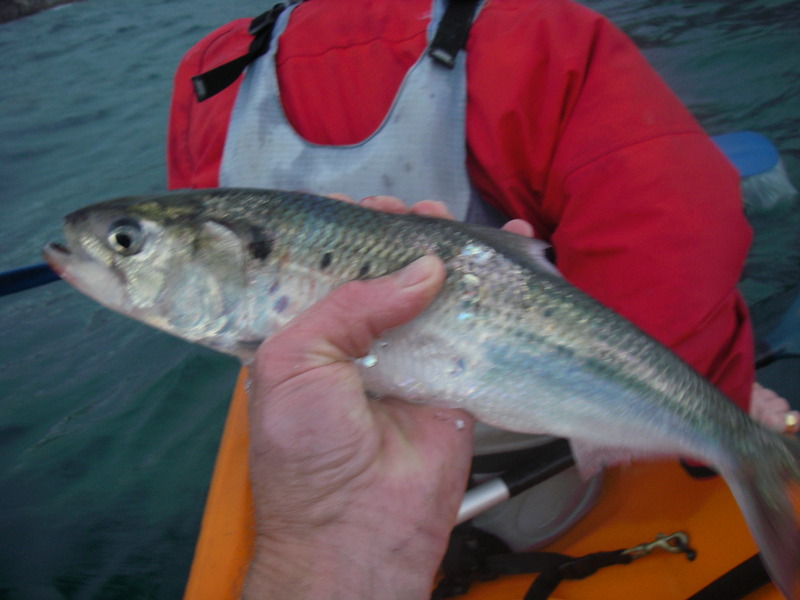 When I was a teenager I caught a mackerel from a tiny hook livened up with a bit of tinsel trolled from an ancient fibreglass kayak. You know, one of those ones that goes round in circles no matter how much you paddle on one side. 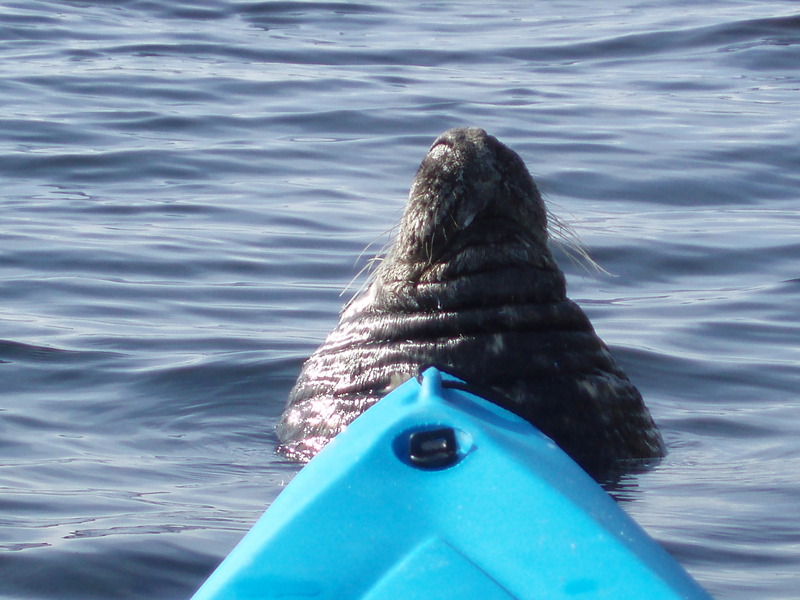 So the advent of the Ocean Kayak range of sit-on-top kayaks which meant you could head off to sea by yourself and be tipped out when you caught a killer whale AND be able just to climb back in again and carry on was a temptation too great. (pause for breath). So I was thrilled with my Ocean Kayak Malibu two and not only hauled aboard so many mackerel that the entire neighbourhood stank like a fishmongers, but also managed to subject my children (sometimes two at a time such is the versatility of the Malibu two) to seasickness and hypothermia on a regular basis. Unbelievably I used handlines for over a year, but I caught quite a few interesting fish such as Black Bream and Triggerfish. The latter survived half an hour’s paddle back to the beach for a photograph to be taken before being released and swimming away quite happily. I adventurously experimented with trolling for bass and lost my first Rapala plug (worth £10) after about two minutes when it snagged on a rock. I lost a load more plugs and also lost a mighty bass due to the inflexibility of my handline. I needed a rod. At exactly that time the legendary Prowler 15 was brought out complete with flush mount rod holders so I didn’t hang around. 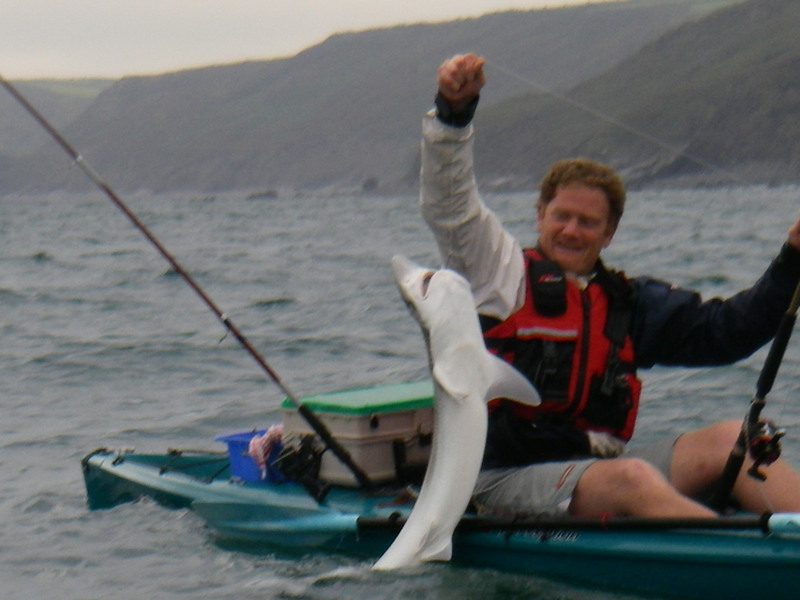 The rather desirable lifestyle of paddling around off the stunning and rugged North coast of Cornwall catching bucketfuls of fish and rubbing noses with seals, porpoises, dolphins, basking sharks and sunfish led to the formation of Bude Old Gits (B.O.G.) Kayak Fishing club. These consisted of people similar, but irritatingly younger and not as nerdy as me. 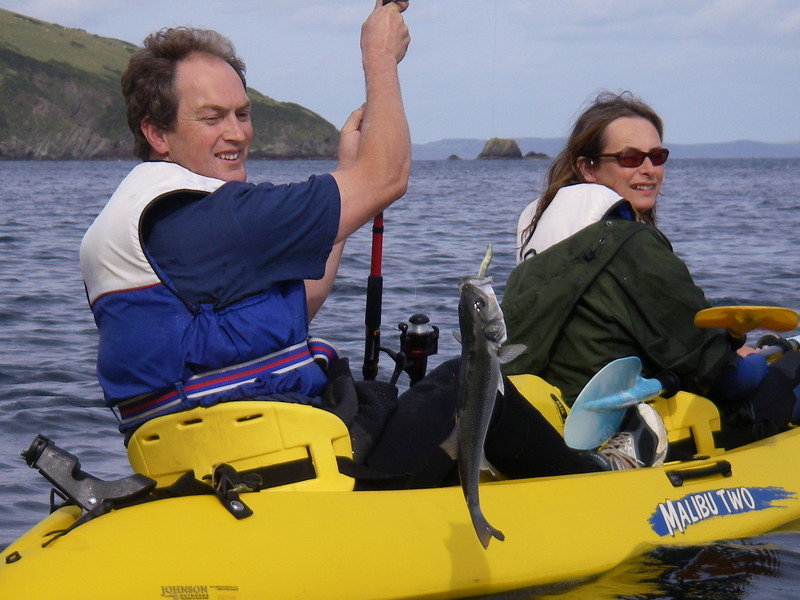 Also those that had a background in fishing, not kayaking, quickly learnt how to catch some monster fish and weren’t happy with the tiddlers that seemed to keep me amused. Actually they didn’t keep me amused but it was all I could catch. 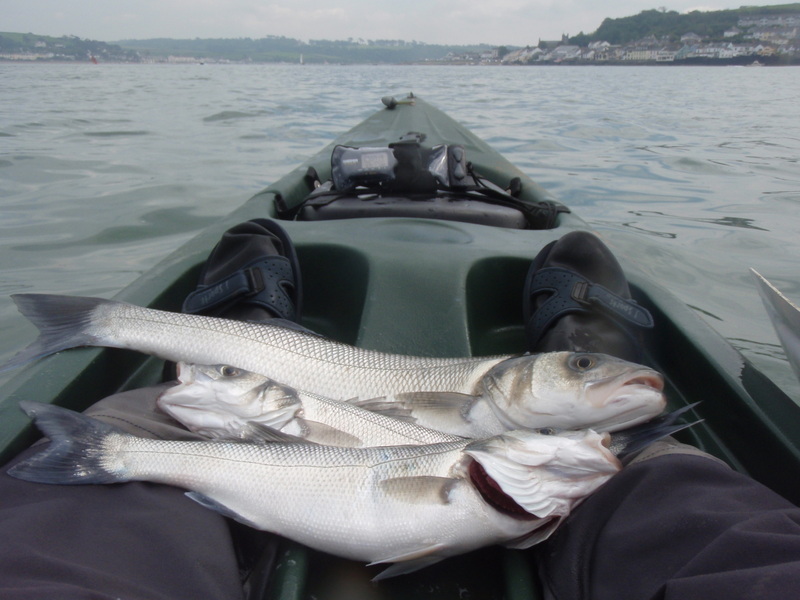 Austen and Kevin managed to haul a couple of 30-40lb Tope onto their kayaks-crazy. It’s taken me a long time to wean myself off mackerel feathers. 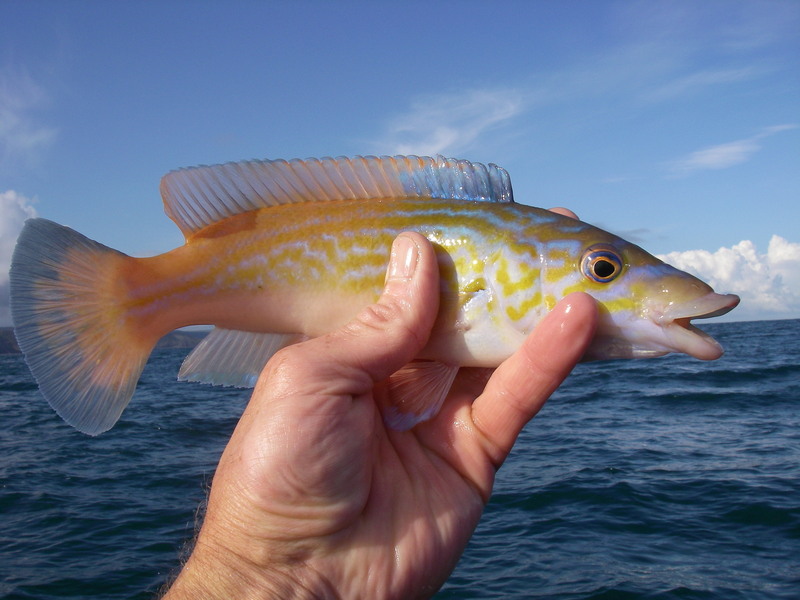 They are just so effective and when spiced up with a little sliver of mackerel flesh they will catch a huge range of fish: pollack, bass, gurnards, wrasse, scad, pouting, whiting and even the odd codling. The most significant bait ‘discovery’ I have made is the use of GULP artificial sandeels that are soaked in foul smelling fishy juice. The first time I trolled one behind my Prowler I caught more bass in two hours than I had in the previous two years. Conservationists don’t panic!.I only keep the occasional larger bass for eating purposes. The majority of my catches get returned to fight another day. And a lot more escape when they are being unhooked. 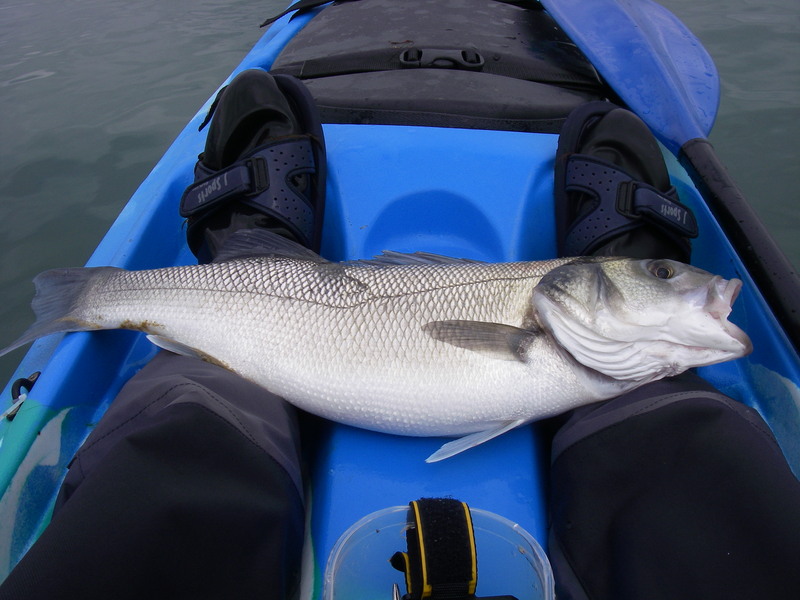 In fact Bass, being very spiny and very wriggly, have been known to somehow climb out of my fish well at the rear of my kayak. My tendency to now favour trolling has accounted for my choice of last two sit-on-top kayaks: an Ocean Kayak Scupper Pro and a Paddleyak Swift. Both are narrower and so faster than the Prowler (which I have now sold) but that is not necessarily better for catching fish. 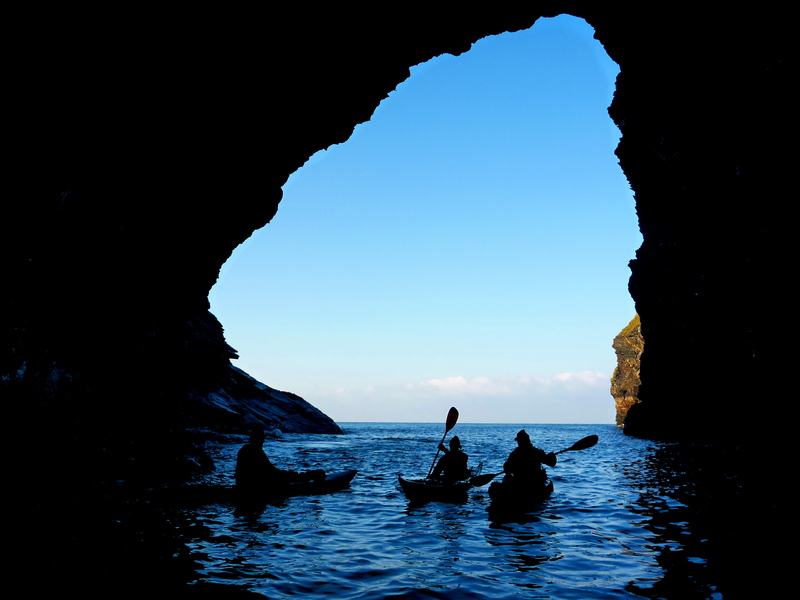 But it’s better for my other goal which is paddling round the entire coastline of Cornwall on a SOT kayak. My most unusual catch to date has probably been a Twaite’s shad. In fact I have caught two-one on the south coast and one on the north-both on GULP sandeels. With a bizarre name like that you would expect them to be small, pale and floppy but they are hard-fighting and impressive. The first one I thought was a herring and brought it home purely to identify it. I was depressed to discover that they are a ‘rare and declining species’. I felt I ought to cook it so it wasn’t a complete waste but it was tasteless and full of little bones. Double depression. I mentioned I am not truly a fisherman. In fact I have NEVER caught a fish from the shore in the UK, EVER. My last act was casting a beautiful shiny Dexter wedge out into a lovely calm summer sea. And boy was it a cracking cast- it went miles.Pity my knot came undone half way through its flight and it plopped beneath the surface forever. And anyway have you ever seen a shore fishermen catch anything? They just don’t. 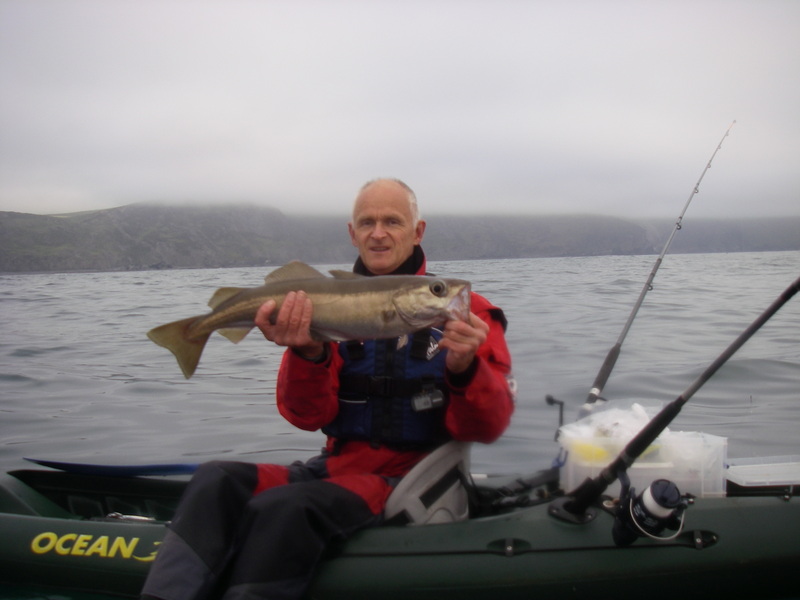 From a kayak you can get over the fish and catch shedfuls of fish. 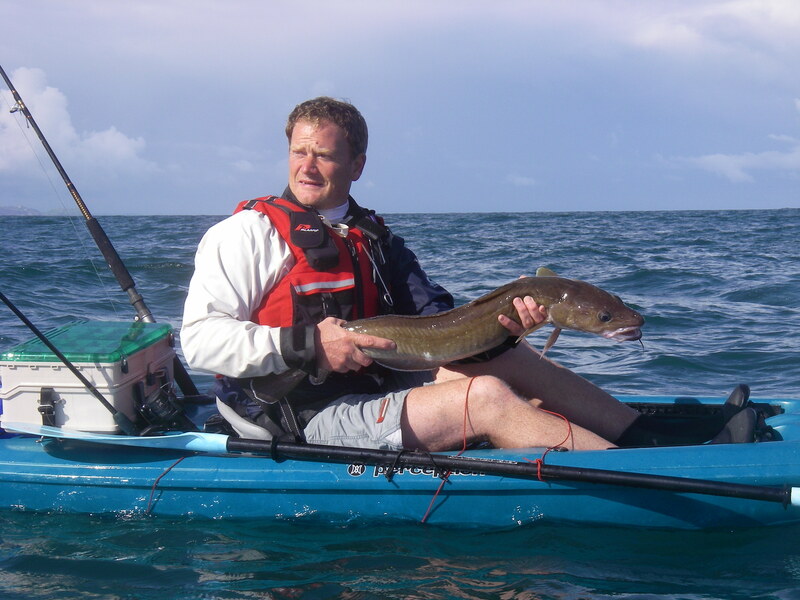 You may be interested to know that I have caught twenty one species of sea fish over the last five years from a kayak. You might equally think this is a weird statistic to know but I am a list type person and have got cupboards full of old notebooks with train numbers in. Not a joke, I’m afraid. This list includes a sea trout and a blenny which got spiked by my Rapala plug as it basked on a rock just beneath the surface. Poor little devil. So what’s my big ambition? To catch a whopping bass and to haul in a shark. Simple. I still regard catching a fish as a bonus, however. 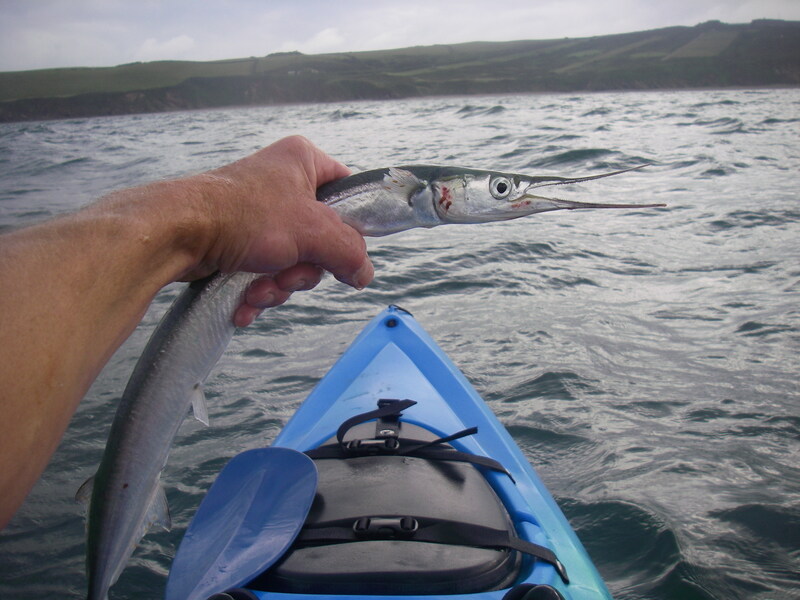 Every kayak trip around the south-west brings more jaw-dropping scenery and the potential of some memorable wildlife encounters…..
At last-after surely the worst summer on record the sea off the north Cornwall coast has assumed a less angry mood and the multitude of smug sniggering fish that have been lurking underneath the waves had better watch out-the B.O.G. (Bude old gits) fishing fleet are coming to get you! B.O.G.s are a bunch of ageing fools who have discovered a new lease of life with the advent of sit-on -top fishing kayaks. In consideration of the fact that I am probably the oldest and most foolish (and certainly the baldest) I am known as the Grey Gurn-nerd. 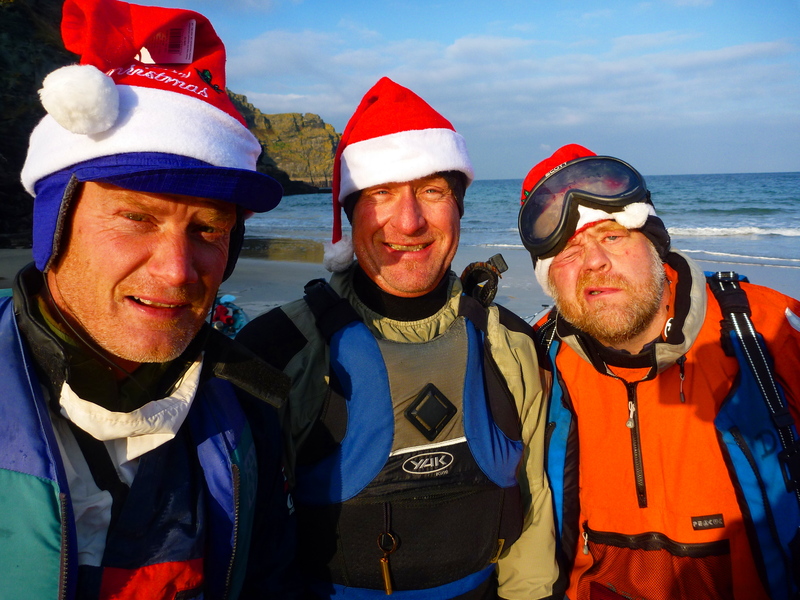 Anyway I rolled up at Boscastle yesterday morning as it was just getting light and was itching to get going on my first exposed coastal paddle for a month. Even my nose hair muscles were twitching. The sea was more or less smooth and little swell-brilliant. As soon as you get out of Boscastle’s sheltered rocky harbour the scenery is BIG. Great daunting cliffs,highly indented coastline,towering craggy islands and a couple of blowholes blasting out spray at you as you pass. I was in a bit of a dilemma-do I loiter and fish or do I clock up the miles and increase the chance of seeing a basking shark or dolphin. 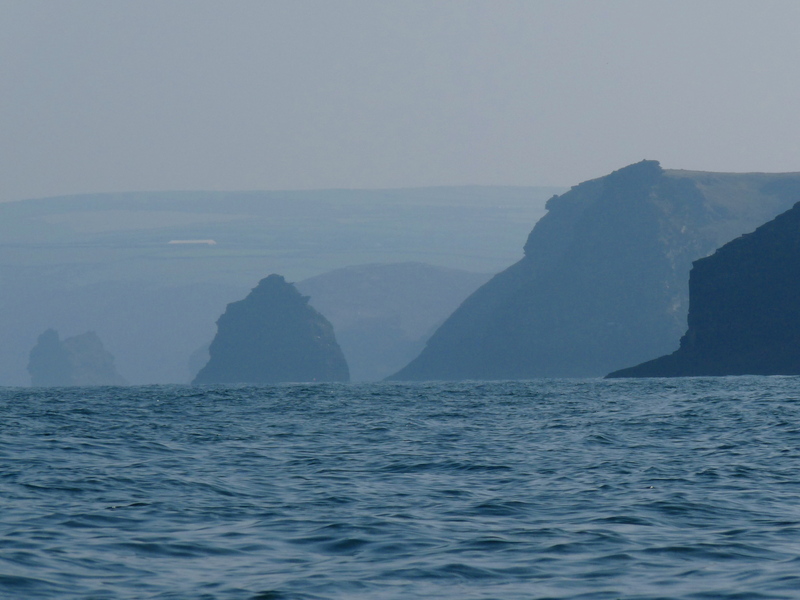 As I am a kayaker rather than a fisherman at heart (sorry,folks) I cranked up the power on my Scupper Pro and cruised towards Tintagel at 4mph. I trolled a toby and hooked several decent sized mackerel. There was a big spring tide ebbing so I drifted the last mile to Tintagel and dropped feathers to the bottom. I immediately pulled up a couple of Scad and then my weight never had a chance to hit the bottom as I hooked dozens of mackerel. Time to head for home and my speed was down to 2mph-didn’t know the tide was so strong here!. I kept a mile out to sea hoping to encounter wildlife but was past only by gannets and a few shearwaters and investigated at very close quarters by fulmars who probably had a whiff of my mackerel. I had a final quick bottom fish and pulled up a small whiting who stupidly skewered itself in the brain. Maybe not such a bad thing as they have nasty teeth and are the closest thing to a piranha hereabouts. 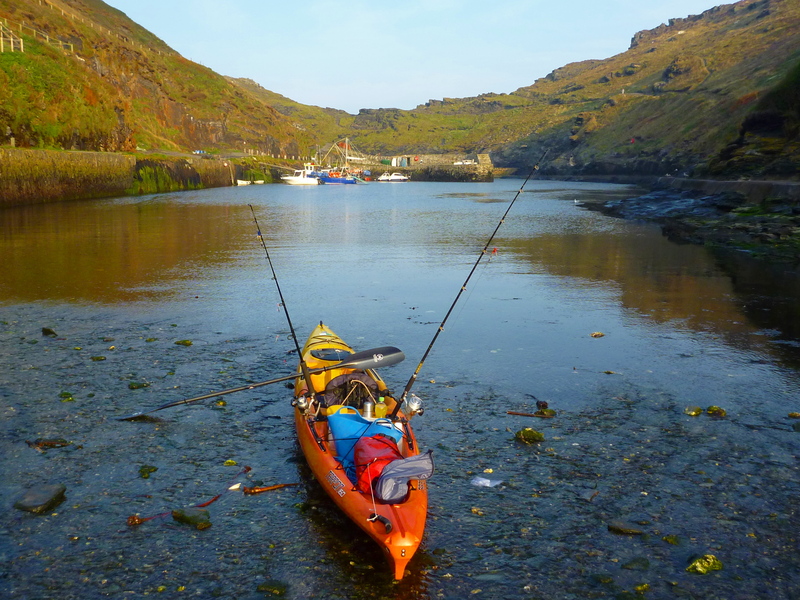 I had my usual socialisation reality check as I weaved in and out of the randomly milling tourists as I walked up Boscastle high street back to my car with my kayak on wheels behind me. The waft of expensive perfume and glower of grumpy holidaymakers muttering about another rainy day doesn’t compare to the wide open sea and absolute silence of kayaking (apart from when I got that hook stuck in my toe). Oh no the weather window has closed-back to wind and rain so the bass can snigger for a bit longer. Mackerel in front of Tintagel head.